Came across these two sites today, if you're interested in illustration for children or illustrated journals, expect to spend a lot of time at each, they are wonderful! 2005 Bologna Illustrators Exhibit this site presents an "Overview of Children and Young Adults' Illustration in Spain" (which was the "guest country of honor" this year). This site is also beautifully designed. 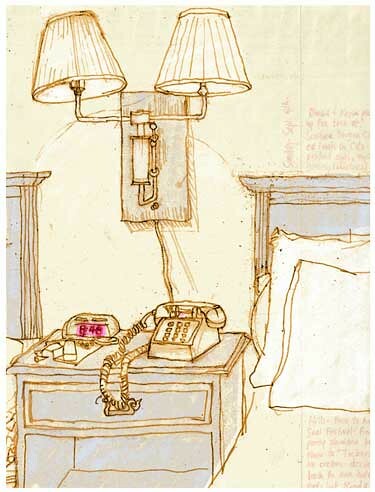 Oh, and the sketch above is another in my trip to San Francisco series, a small view of my hotel room.